FREE Website Evaluation. Call 614-579-0374. What Is More Important To A Small Business: SEO Or Web Design? How Are We Different From Other Columbus SEO Companies? How Can Hiring A SEO Company In Columbus, Ohio Help My Business? Adding a Location or Changing Your Address? 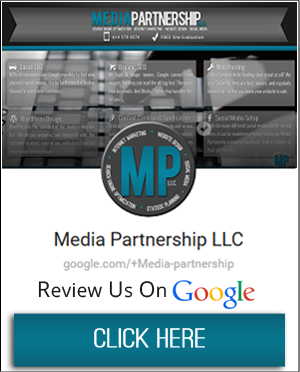 Media Partnership is a Columbus & Cleveland, Ohio SEO company serving businesses nationwide. We believe in working with our clients to help them achieve their marketing goals through SEO (search engine optimization), local SEO, social media set up and onsite training, website design, branding, marketing agency services and a multitude of other new and exciting tools that are at our disposal. Media Partnership believes in honest Columbus Ohio SEO services following Google’s search engine optimization guidelines. We have found that by doing only the right forms of search engine optimization in Ohio that our clients get more traffic to their websites and keep their ranking after they have achieved front page listings. Here at Media Partnership we believe in personal relationship and we meet in person with each and every one of our clients at their place of business. Businesses looking for SEO services in Columbus or Cleveland, Ohio are no different than businesses that we have worked with across the nation due to the fact that they are looking for more new customers or a specific type of customer. We meet with you and learn all we can about your business and the type of clients that your business is looking to get through SEO in Columbus, Cleveland, Ohio or your local market. After meeting with you we do keyword research to find the terms that we both feel would bring you the highest return on your investment through SEO Services and online marketing. Call or email us today for a free consultation 614-579-0374. 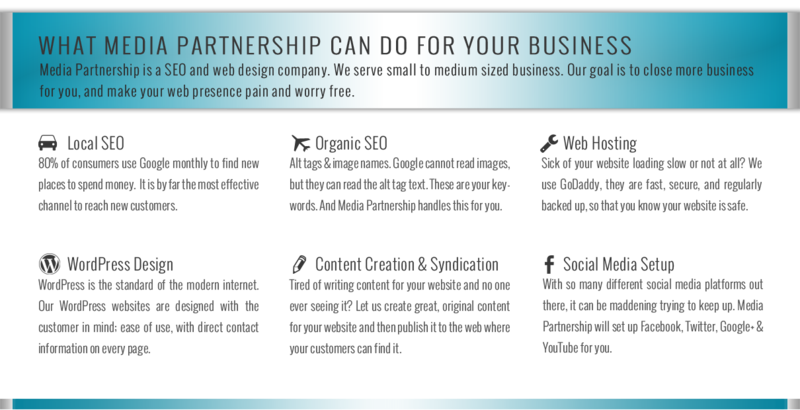 Why Choose Media Partnership LLC. To Handle Your Online Presence? A business’s online presence is as important today as having business cards was yesterday. In business and sales circles, it was considered a faux pas to not have business cards. They were the simple connector that could facilitate additional sales, customer relationships, or professional contacts. Today, that role falls to the website. Potential customers regularly turn to the internet to find the goods and services they need. A business that does not take their online presence seriously will quickly find themselves left behind as those customers and contacts find competitors instead. Why not just do it yourself and try to save money? There are plenty of tips on how to promote a business or website online out there. What a lot of these tip sites fail to mention is the changing nature of the internet and need for regular effort. The best results are generated by regularly engaging in activities to boost placement in searches. That is several hours out of a person’s week that they could otherwise spend on servicing their customers, managing their business, or even enjoying some free time. The landscape for Columbus SEO does change. These changes are reflected in the analysis of search optimization data which are then used to make changes in direction. That may include a shift in strategy to test and better accommodate different keywords. Keyword research is of great importance whether a person is working on their website or using Pay-Per-Click advertising. Throwing weeks and months of effort into the wrong keywords is not only a waste of money but it could be bringing in the wrong audience. What good is having 10,000 hits if only 1,000 of them were ever interested in the offered service? It is far better to have 5,000 hits with 2,500 potential customers. This example demonstrates a very important point- quality matters in Columbus SEO. Traffic means little if there are no potential conversions to be had. So why choose a premier Columbus SEO company to handle your online presence? SEO is a complex beast that requires attention to detail and a built skill-set to do well. The fact of the matter is, a person could probably get much more accomplished for their business in the time it will take to learn and execute our Columbus SEO practices. It is a simple matter of efficiency. The multiple hours that would be spent over the course of months are better put to use on a business’s core competency than trying to learn SEO. That is the benefit of utilizing a local Ohio SEO services company to manage an online presence.